More than 78,117,637 beer lovers served! 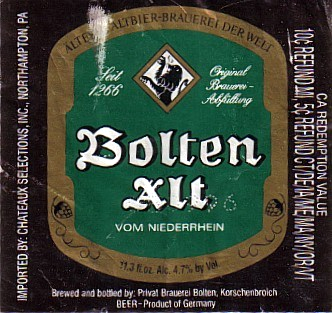 Bolten is the "Ältest Altbier-Brauerei der Welt", according to the label. They are brewing a couple of beers for Im Dom on a temporary basis. Brown, moderate carbonation, low head. Sweet aroma, lots of hops. Medium body, lots of brown malt flavor, moderately bitter. Slightly roasty finish.